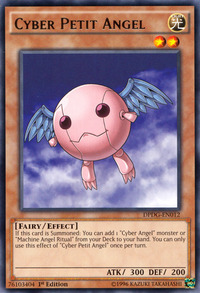 If this card is Summoned: You can add 1 "Cyber Angel" monster or "Machine Angel Ritual" from your Deck to your hand. You can only use this effect of "Cyber Petit Angel" once per turn. This monster is a Cyber counterpart to Petit Angel. Despite that, it is very much weaker than its original version, as Petit Angel has 600 ATK and 900 DEF compared to this monster's 300 ATK and 200 DEF. This monster appears in the artwork of Machine Angel Absolute Ritual and Magnificent Machine Angel.